When you can give even just a little more than you ask for, there is no limit to how wealthy you can be. If you offer a dollar and five cents worth of value for the price of a dollar, you will always have plenty of customers. There is no need to strive and compete. Because you are able to allow and create. You are immersed in a sea of abundance. Your thoughts, your efforts and your passion create meaningful value out of the ever-present abundance. The more honest and authentic you are about being who you are, the more easily real value will flow from what you do. The more thankful you are for what you have, the more value you’ll be able to give. If you seek to take advantage of others, you end up losing the great, unique advantage of being you. Seek instead to serve others and as you do, your own magnificent possibilities are fulfilled. Make it your intention to continually give good things to life. And life will be exceedingly good to you. 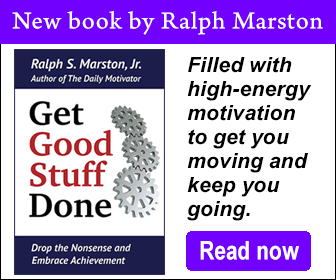 Copyright ©2013 Ralph S. Marston, Jr. All Rights Reserved. The Daily Motivator is provided for your personal, non-commercial use only. Other than personal sharing, please do not re-distribute without permission.